KAMPALA, UGANDA (THE INDEPENDENT) -- The US has warned East African Community (EAC) leaders that will converge in Kampala this week that their planned ban of the importation of used clothes by 2019 violates conditions set to expand trade and investment in Africa under the African Growth and Opportunity Act, known as AGOA. 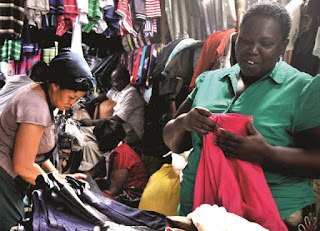 In March2016, the head of states in the EAC, which comprises of Uganda, Kenya, Tanzania, Rwanda, Burundi and South Sudan agreed to ban import of used clothes in the region in three years as part of the EAC Vision 2050 and the Industrialization Policy to enhance manufacturing sector that currently contributes 8.7% to the regional Gross Domestic Product to 25% by 2032. At a press briefing last week, the acting head of economic and regional affairs at the Africa Bureau of the US State Department Harry Sullivan confirmed that the office of the US Trade Representative (USTR) could review trade benefits to Uganda, Rwanda and Tanzania under AGOA after a complaint by U.S. interests about an East African ban on imports of used clothing. “The leaders of Rwanda, Tanzania, and Uganda are going to meet on this issue, so I wish I was privy to what they might decide. They might not have come to consensus yet, I’m really not sure, but we are asking those three countries to do two things. One is to decrease their tariffs to their pre-2016 levels, and the second thing we’re asking is to commit that aside from health or sanitary reasons, not to phase out the export of used clothing,” Sulliavan stated. Last year, the US Trade Representative (USTR) revealed they are reviewing their trade relationswhips with East Africa in response to a petition filed by the Secondary Materials and Recycled Textiles Association (SMART), which complained that the ban “imposed significant hardship” on the US used-clothing industry and violated AGOA rules. AGOA, which was extended last year, allows exporters from African countries that meet given terms, to export their goods into the U.S. without the usual tough restrictions. In turn, America also gets some preferential treatment of their products. Uganda, Rwanda and Tanzania have raised taxes for used clothes and offered incentives to manufactures to invest in their local textile sectors starting in the financial year 2017/18. Uganda has increased the environmental levy imposed on used clothes from 15 % to 20 % of the cost and freight insurance (CIF) value in some taxes during the post-election budget. Rwanda has increased taxes on import of used clothes for the second consecutive year from $0.2 to $2.5 in the last financial year to US$4 per kg this financial year arguing that it intends to protect the market for new clothes made locally. In the financial year 18/19, Rwanda plans to charge $5 per kg on import of used clothes. ANALYSIS | ISAAC KHISA | Among optimists, the proposal by East African Community (EAC) member states to ban the importation of used clothes by 2019 is great because it could spark the growth of a local textile industry in the bloc. But pessimists say the move will complicate the region’s trade arrangements with leading partners including the U.S. which is also a large exporter of used clothes to the region. It could also increase the cost of clothes in countries where the majority of the population is poor and lead to the import of new cheap clothes to out-compete the very industries the regional governments seek to protect. Faced with these options, some business analysts are proposing a middle-ground that reflects the status quo. They say the region is better off allowing entry of used clothes as it also develops its own textile industry. “As a region, there’s need to allow entry of any products provided there are no illegalities in the sale of those items on our markets while at the same time boosting their production locally,” said Charles Ocici, the executive director at Enterprise Uganda, a USAID-sponsored agency for equipping skills to small and medium firms. He suggests a co-existence of used and new clothes in the regional markets and the use of taxes to ensure fair competition between them. That way, Ocici says, the burden of the ban will not only be felt by the poor but by all clothing consumers, who will, in turn, buy the locally made clothes. He added that the co-existence will also make EAC avoid unnecessarily frictions with the powers where used clothes originate.